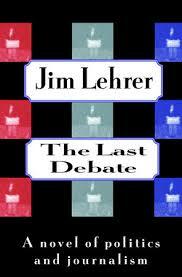 Twenty years ago, PBS’ Jim Lehrer wrote a book titled The Last Debate. It was a story about a group of debate moderators who saw it as their responsibility to stop a megalomaniacal man from becoming president. They determined that they were the final vanguard that could prevent the inevitable. After the debate, the ringleader went into hiding in Greece while two other participants went on to dominate the morning gabfest on cable. It’s not a perfect book by any stretch. But it was intriguing. I’ve returned to it every presidential cycle and found it’s reason for being to be compelling. It captures all of what we see in modern debate politics: the moderator as a persona, the attempt to catch candidates in misstatements, the antagonism between candidates and the media, and the difficulty of getting the candidates to move off their standard talking points. By now you’ve certainly read about the moderators at last week’s CNBC Republican debate. The general picture that emerged was of moderators inserting themselves into the middle of things, becoming actors in the debate rather than questioners. This assertion is itself at least in part a media creation fostered by opportunistic politicians like Ted Cruz. Senator Cruz made his little “this is why people don’t like you” speech to great applause and guaranteed sound-bite status. But as Ezra Klein observed, Cruz did so by misrepresenting every question that was asked by the moderators to make it sound outrageous. I’m not saying that the moderators didn’t deserve critique. Some of the set-up questions were deliberately provocative (“comic book campaign“) and unnecessary. I tend to like John Harwood but was surprised to see him on The Daily Show the week before the debate. Harwood shared a clip in which Ben Carson had hinted at “what was next” after gay marriage was legalized. It was clear that Harwood wasn’t going to become a Carsonite at any point in the near future. It’s fine for Harwood to have personal views about candidates. But going on cable television the week before to raise doubts about that crazy candidate isn’t the way to get people to give you the benefit of the doubt. There are a number of factors that contribute to the impasse we’ve now reached. I’ll mention three. First, James Fallows’ Breaking the News remains one of the finest books on modern journalism I’ve ever read. He argues that the combination of post-Watergate crusaders, corporate consolidation, cable news talkathons, and lazy journalists combined to make a very different kind of media environment. The presence of opinion shows that allow endless speculation and inside politics looping in a 24 hour news cycle creates news bits where real news is lacking. Third, there is an assumption that a good question will demonstrate that the Emperor has no clothes. I really enjoyed Matt Bai’s All the Truth is Out last year. It’s the story of the 1987 implosion of Gary Hart’s presidential campaign (featuring a bit role by current candidate Martin O’Malley). Bai tells of how Hart was running a campaign from an earlier era at precisely the point when tabloid journalism was born. All three of these factors combine to create the environment in which contemporary debates occur. They actually provide very little probative value. I think people watch debates the way non-race fans watch auto races: hoping for a terrific crash. What’s memorable about debates from 2012? “Self-Deportation“, “Binders of Women“, and, of course “Oops“. You could see the very moment when the wheels started to skid into the turn. 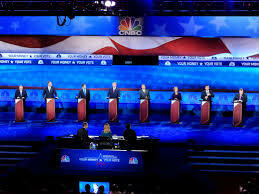 The CNBC debate somehow managed to make the candidates seem like aggrieved parties. Their response has been to meet together and take control of debate negotiations away from the Republican National Committee. (Why is the RNC allowed to broker the terms of debates? Where is the public interest?). So now the campaigns themselves want to dictate the conditions of future debates. Ben Carson suggested that moderators only be people who have voted in Republican primaries. The Trump campaign announced that they’d negotiate directly with the networks (because “the art of the deal“). The prospect of the candidates dictating terms under which they’d agree to debate lends itself to easy ridicule, as Andy Borowitz and Alexandra Petri discovered. But the real issue runs much deeper. These debates serve little public purpose. We are months away from national selection of candidates. Public opinion polls are loosely based on name recognition and media focus. Candidates simply repeat talking points, vague generalities, and mis-statements about the other party. It’s good for energizing the base and keeping donations flowing but plays little role in creating an informed electorate. Policy is not discussed, giving way to promises to make America great again and tell Putin who’s boss. So rather than find ways of mitigating the symbiotic negative relationship between the media and the political machines of the candidates, I have a better idea. Just stop. The candidates can continue to make their stump speeches and do their non-interviews on Sunday mornings. But let’s drop the pretense that anything can be learned by putting them all together on a stage and expecting them to say anything meaningful. Maybe just end the Republican debates? The Democratic ones have been great!